1. What is a Patch or Service Pack? As with any software, bugs can be found or features missing from the orginal software supplied. So, Microsoft releases a patch which fixes a problem they found or a missing feature, this patch will replace programs and files on your system with newer versions. A Service Pack is actually a collection of patches put together into one package so your system is up to date. 2. Where can I get the latest Patches or Service Pack? Most patches are available with the Windows Update tool in either Settings or the Control Panel, System and Secirity, the technical Knowledge Base or Microsoft's Security Page. 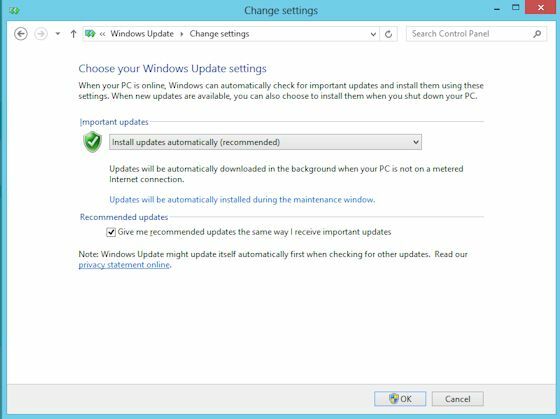 If you have Automatic Updates enabled on your PC, then you will get them downloaded and installed automatically, this will ensure your PC is always up to date. The latest update for Windows 8 is called Windows 8.1 which is available via the App Store. Press the Windows button and click on the Store tile to access the store tile, and Windows 8.1 upgrade should be displayed if you are running Windows 8.0. There is a Cumulative update for Windows 8 for all updates until April 2013, since release: KB2822241. Also, there is a Cumulative update for Windows 8.1 for all updates until April 2014: KB2919355. 3. How to I save Windows Update files? Updates are also available via the Microsoft update Catalog gives links to the patches and these can be saved to your hard disk (you need to know the KB numbers e.g. KB823980 or security update e.g. MS03-026. 4. I cannot download Microsoft's Windows Updates? First check your Update settings in the System control panel in the Automatic Updates page. If you want to manually download files, select Turn off automatic updating. Also, check your Privacy and Security settings in Internet Options are not too restrictive, Medium/Low settings should suffice. If you have problems with downloading updates make sure Automatic Windows Update and the Background Intelligent Transfer Service (BITS) services are running. Also, try re-registering the windows update DLLs in c:\Windows\System32 e.g. regsvr32 wu*.dll. 5. I have downloaded Service Pack for Windows 8 but it will not install? First make sure you have enough room on C: to save backup files and install the service pack. Also, check that your copy of Windows has a legal Product Code and is Activated. You can update your Product Code with a new one using these instructions. Also, check that the language version of the pack is the same as the language of Windows you already have installed. If for some other reason you cannot install try these tips: run a defrag on C: drive, make sure you shutdown any background programs that may interfere, make sure you do not have bad or old drivers installed, check for errors in the Event Log. Make sure your PC meets the minimum requirements for Windows. 6. I have installed SPx but some applications or hardware does not work? You may need to reinstall the application or the device driver software again as the Service Pack may have overwritten the application's files or device drivers. 7. Some patches say its for 32 bit or 64 bit edition. Which one do I use? Windows 8 supports 32 bit and 64 bit PCs. Most PCs with Intel Core CPUs are 64 bit CPU based computers, the older Pentium 4 or lower or 32 bit based CPUs. CPUs that support EM64T (Intel 64) or AMD64 technology can run 64 bit versions of Windows 8. The Itanium processor used on high end workstations or Servers will be 64 bit. See Control Panel, System and look for System type. 8. I have tried to download the latest patches, but there haven't been any for some time? To cut the number of patches to download and install, Microsoft have decided to release all patches every second Tuesday of every month. See here for more details of the changes. 9. I have an office or company with lots of PCs, how can I easily deploy patches? Microsoft has a product called Windows Software Update Services (WSUS) which you can download and install on any Windows 2008, 2008 R2, or 2012 server and use Group Policy to deploy patches to all your PCs in your office or company. 10. How do I update Windows 8.1 to update 1? Download the patches for KB 2919355 and install them in the following order: KB2919442, KB2932046, KB2919355, KB293839, KB2937592, and KB 2934018. Changes in update 1 include improved taskbar which is now available on desktop and start screens, improved popup menus on the start screen, a power and search charm icons on the start screen and title bar for Windows store applications to allow you to minimise or close the apps.